Have you ever drank out of a mug only to discover there's a spider in there? I have, and it's haunted me ever since. My number one life rule is to always, always check a glass before drinking out of it so I can't imagine how this poor girl felt when she discovered the thing touching her lips wasn't fancy coconut water but in fact some horrifying sea-like creature. Coconut water is the fanciest of all the waters. Forget vitamin water and smart water, and all those other waters that, let's be honest, are just bog standard bottled water with a posh label. Coconut water wins for being the most expensive, most pretentious of all the waters while still managing to taste totally horrible. What you don't expect from the fanciest of all the waters is that when you've gobbled up every last drop, there's a mutant sea creature lurking in the bottom of the bottle. But alas, that's what New Yorker Barbara Kline found as she polished off a carton of Vita Coco. "When I took a big gulp, I swallowed a chunk of something," Barbara told Buzzfeed. "It tasted very thick and syrupy. It was disgusting." When Barbara poured the water out, instead of running clear, the water was a murky grey colour. Now deep breaths people because it's about to get real gross, real quick - upon cutting open the bottle, she found THIS TERRIFYING SEA-LIKE CREATURE. ​Barbara said she immediately threw up which we kind of feel like doing right now, tbh. 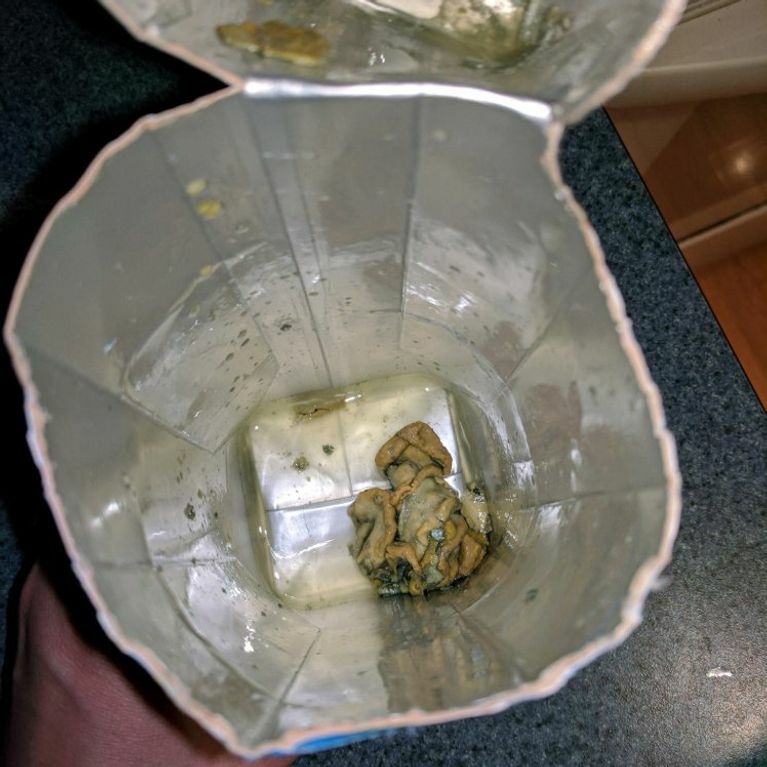 Vita Coco have since responded, saying the offending alien-looking object is likely to be a simple case of harmless mould that's unlikely to cause any health problems. Now, isn't that just a great relief? It's just harmless mould that Barbara drank. Gulp. Vita Coco's Global Director of Corporate Communications, Arthur Gallego, told Buzzed: "​Vita Coco is a preservative-free beverage made from naturally-occurring ingredients. While the consumer has yet to return the product for testing, this looks like typical food spoilage. "We take all consumer inquiries and product quality issues very seriously and as a global brand have protocols to properly investigate quality inquiries." Kline has stated she followed the storage guidelines and added she's "highly allergic" to mould, experiencing vomiting, diarrhoea and asthma attacks since drinking the spoiled Vita Coco. The company have asked her for the mould to test it but she has declined as she plans to sue them. Buzzfeed also pointed out that unfortunately Barbara isn't the only Vita Coco customer to find this kind of slime in their beverage.